Originally published in 1961. Russian Marxist philosophy of science originated among men and women who gave their whole lives to rebellion against established authority. The original tension within Marxist philosophy between positivism and metaphysics was repressed but not resolved in this first phase of Soviet Marxism. 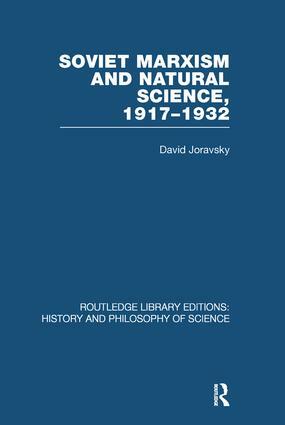 In this volume the author correlates the development of ideas with trends in the Cultural Revolution and against this background it is possible to understand why debates over general philosophy gave way to conflicts over specific sciences in the aftermath of the first Five Year Plan and why there was a genuine crisis in Soviet biology.